Don't these people also own the old Yale Pharmacy building on the next block? Photo seems to imply the large building could be used for a restaurant. Unfortunately, due to CoH's ridiculous parking requirements, that would require about double the number of spaces currently available on-site. The small dry cleaning building could potentially be used for a restaurant, since it would only require 16 of the 70 available spaces. I know personally in the past that Friends for Life next door expressed interest in the Alabama Furniture property. Wow. If that really is Ramen Tatsu-Ya this is big news. Rumors of them expanding to Houston have been floating around for a couple of years. Renderings show parking along Yale, but drawing shows the building facing Yale. It looks like they'll preserve the current dry cleaners and add on to the Alabama Furniture building, extending it North. No vehicular entrance on Yale, which I like. Also Bernie's Burger Bus this close to my house is not good news for the waistline. Uh oh. Austin is on the creep again. Maybe the gut busting burgers at Bernie's will help keep things in balance. Gotta live up to that "little Austin" nickname, I guess. Can't wait to see this! I think this is outside the "dry area"? It will be a profitable venture for the owner of the property as well as those who lease. Can't wait to see this! I think this is outside the "dry area"? Just outside. The east side of Yale is "wet" from 22nd St. north. The west side is dry up to 26th St. This map is roughly correct (the eastern boundary is a little off). Interesting, Kim's liquor is directly across the street from where the dry line commences at East 26th and Yale. That does make sense, as all the convenience stores have historically been on the east side of Yale, from 20th up to 610. This would explain why. New flyer now shows street facing parking along Yale. Ugh. Not listed?? I was looking so forward to that. That was the first restaurant me and my girlfriend went to when we went to Austin a few weeks back. It's going to be a hit when it comes here to Houston. I'm still holding out hope for Ramen. Tatsu-ya was shown as being in the other building (the dry cleaners), and that building isn't shown on this flyer (perhaps because it's already leased?). Uberrito is what used to be Mission Burrito, right? Also, good news that this flyer is still showing the building fronting Yale with parking in the back. Love it when a plan comes together! Absolutely excited for this amazing undertaking that is about to happen! Katy few weeks out, 22nd and Yale Street in the Heights deal is signed for store number 3 coming late summer next year! 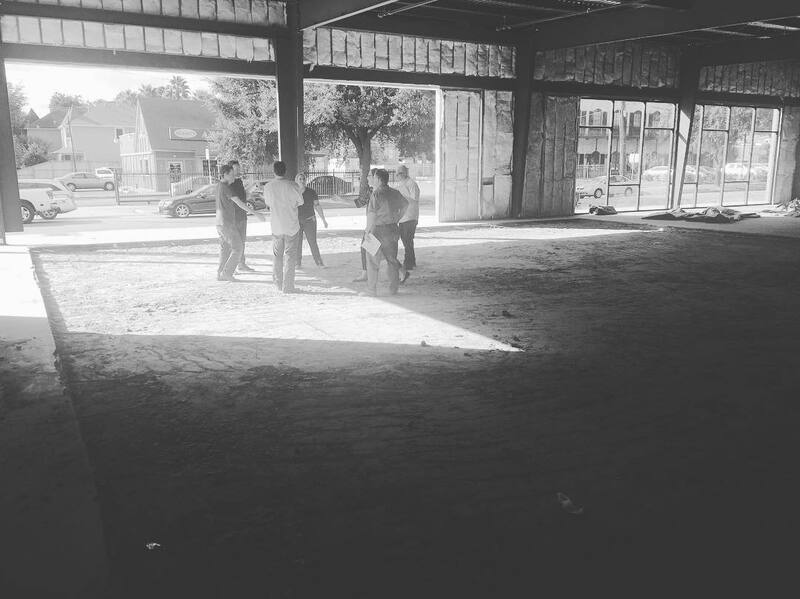 Jamie Weaver with Edge Realty is the leasing agent at nearby Yale St & East 22nd St. The entire block fronting Yale St. between 22nd St. and 23rd St. was purchased by Braun Enterprises, who plans to build a new retail/restaurant center from one end to the other. Bernie’s Burger Bus made a splash when they recently announced plans to move into the new building. According to Weaver, there are no other signed tenants yet. He also said another restaurant is not out of the question but it would have to be smaller in scope. “We’re talking to retail and restaurants,” he said. Uberrito Mexican Grill wasn't listed anymore as of last fall. Here's a screenshot of the proposed site plan from either October or November (since Edge Realty deletes previous copies and updates newer pdf files to the same link/page). The estimated completion listed was the second quarter of 2016. Demo permit for 2200 Yale (Alabama Furniture) issued today, and for 2222 Yale (dry cleaners) yesterday. The dry cleaner site doesn't appear on the site plan in the current flyer. Only spaces offered on that flyer are the north end cap and the space immediately adjacent. The dry cleaner site may end up just being parking, or it may already be leased to an undisclosed tenant. It's been almost ten months with no confirmation about the ramen shop. Sweet. Anything on other retailers that have signed on? Making Room for Bernie’s Burgers at the Alabama Furniture Spot on Yale St.
Alabama Furniture & Accessories’ 2-decade locale is getting cleared out for its planned redo, a neighbor notes. The building at 2200 Yale St. got a demo permit yesterday and started coming down later in the day. The site at the corner with 22nd St. is being cleared for another Braun Enterprises project: a third non-mobile Bernie’s Burger Bus location, as confirmed in October. The furniture store (named for its original 1992 location on Alabama St.) cleared out of its Yale home by the start of March, and has flown even further north to 4900 N. Shepherd Dr. between W. 43rd St. and Tidwell Rd. Well guys, it looks like there won't be much retail for this development at 2200 Yale St (link to previous site plans and renderings). 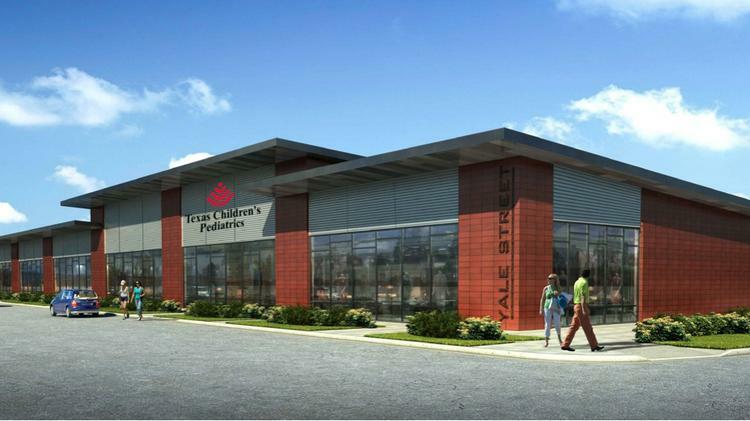 TCH Pediatric Associates Inc aka Texas Children's Pediatrics and Texas Children's Urgent Care signed a lease for majority of the spaces in the center under 2200 Yale Realty (Braun Enterprises). Texas Children's Urgent Care leased the 3,000 square feet space to the right, that was previously planned for a restaurant. Next to Urgent Care is Texas Children's Pediatrics with over 10,000 square footage. The Bernie's storefront should open later this summer. The Texas Children's Heights location should open in January 2017. The 13,112-square-foot outpatient center at Yale Street is a relocation of Texas Children's Pediatric Heights at 2600 North Loop West Freeway, a Texas Children's spokesperson said. That location will have a Texas Children's urgent care center next door. It's unclear when the 2600 North Loop West Freeway location will be vacated. Texas Children’s Hospital also signed a lease for a 19,291-square-foot location near the University of Houston, at the corner of Martin Luther King Jr. Boulevard and Griggs Road. That will be a relocation of Texas Children’s Pediatrics Cullen at 5751 Blythewood St., the Texas Children's spokesperson said. Baker Katz represented Texas Children's in its Blythewood lease. The Texas Children's Heights location should open in January 2017. An opening date for the Blythewood location wasn't available. Unless CoH has dramatically sped up their permitting and inspection process, there is approximately zero percent chance that Bernie's will open this summer. Maybe they are talking about a Houston summer? So, October would still be "late" summer. But you are right. CoH has been terrible getting restaurant build outs permitted recently. There are a number of projects that are just sitting right now and others that have been delayed by months thanks to CoH. I do not see a burger coming out of this place until November at the earliest. FWIW, TCH says they'll be open for business at the new location in January. They have completed most of the exterior work with the exception of installing the windows at the Bernie's Burger Bus side. I only took pictures from the back of the building. Also, wanted to note that they have a bike rack! I would not be surprised if they beat Bernie's, despite the announced "summer 2016" opening, given that we're now in the 2nd half of October, and the interior build-out hasn't started. Apparently it's easier to get a pediatric clinic permitted than a burger joint. Presumably the window's aren't in yet because they still have to get the bus inside. It does appear that TCH will be complete first. Could be waiting to put the bus in but it also appears that the floor isn't complete. Wondering if the final design/layout is still pending. Build-out of Bernie's appears to have started. At least they've put plywood over the window openings. They have a glass door and the bus is inside but there is still work for the rest of the build. Sorry for the picture. 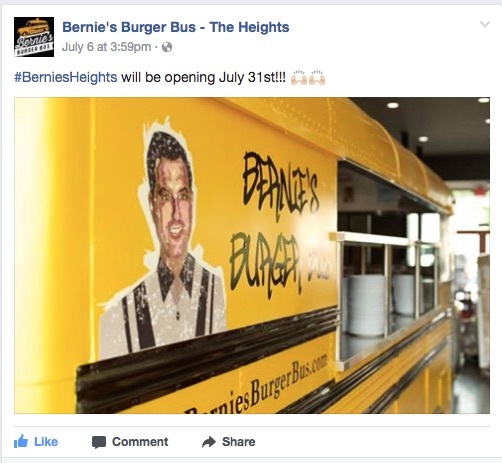 Some updates on Bernie's Burger Bus Heights location. New projected opening is April 2017. 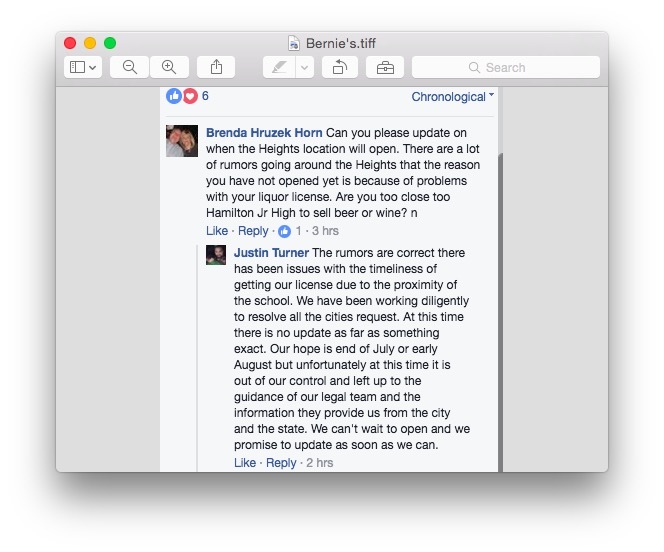 It appears that Bernie's is having trouble with their license and won't open until the end of July or early August. Here is a post from their Facebook page. It looks like they're blocking off what the city must have determined is a side patio so no one can see anyone having a beer on it, in accordance with CoH ordinances. Look's like Bernie's is finally opening. Set to open July 31st. The visibility barrier that (I presume) the city made them put on the south wall is hideous. Bernie's Burger Bus opened yesterday in the Heights at 2200 Yale.